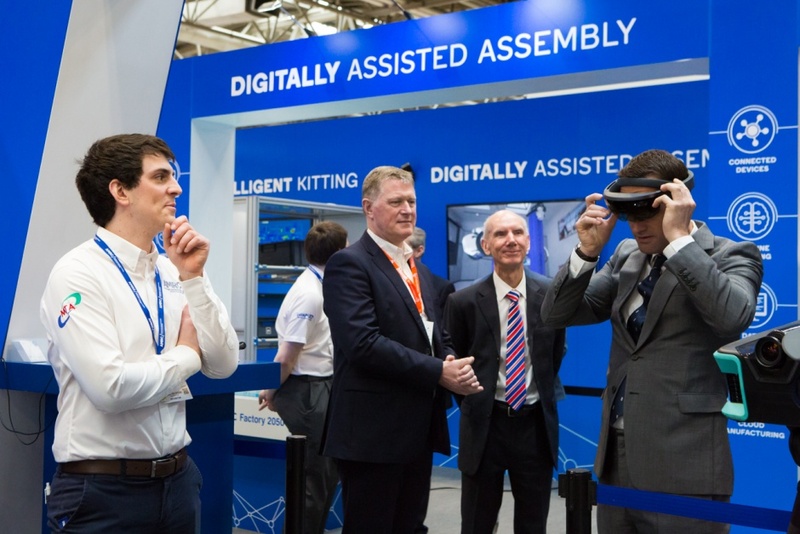 Of all the trends affecting engineering and the manufacturing sector at the moment, Industry 4.0 – or Internet of Things – looms largest at this year’s Mach show. Indeed the event is itself billed as an industry 4.0 exhibition. The exhibitors’ stalls aren’t the only place where visitors can learn about this new suite of technologies. The seminar theatres have also featured many sessions touching on how digital developments can be made to work for enterprises. Taking a specific look on one particular aspect of technology, measurement, on Tuesday Markus Grau, director for 3D machine vision at Faro UK, looked at how requirements that at first glance seem to contradict each other can be harmonised, with measurement technology satisfying both an increased need for flexibility and mobility as well as necessity for closer integration processes and infrastructure; Grau also examined human robot collaboration. On day 4, Rab Scott, head of digital at the AMRC, took a more general view, presenting a session on “the changing face of manufacturing in a digital age”, which will give an introduction to the adoption path for these latest technologies into existing businesses, and insights on how value can be extracted from industrial digitalisation. AP&T is making a feature of its development of industry 4.0 solutions together with its customers. “Since we are responsible for the complete line, all of the included units are fully integrated from the start. This makes it relatively easy to produce and analyse that information never presented in an easily accessible manner,” says chief technology officer for product development Christer Bäckdahl. Measurement data is collected on an ongoing basis then analysed and stored in the customers database using AP&T’s data acquisition platform. The customer decides who is to have access to information and which classification level is to apply. “All of the data is available and can be accessed through our cloud service for remote connection. You can have the data presented on your tablet or smartphone, on the control panels at the line or on your computer at the office,” says Bäckdahl. Carfulan Group claims of this technology will help manufacturers into and beyond industry 4.0, with its display at Mach including multi-centre inspection equipment, 3D printing, off-line tool presetting and inspection and is turned part measurement. It engineers are challenging visitors to bring along their most complex parts and components. “We’ll prove how easy it is to measure them with precision accuracy using our best-in-class machines,’ the company claims. FANUC UK says its theme this year is connectivity. “Alongside a selection of our most recent product launches, many of which will be making their UK debut at MACH, we will also be demonstrating FANUC’s capabilities within the emerging markets of artificial intelligence, Industry 4.0 and the IoT,” says Andrew Armstrong, sales and marketing manager. All machines on the stand will be connected via a single software platform: MT-LINKi. “The MT-LINKi represents an easy and cost-effective way to connect and monitor machines on the factory floor,” says Armstrong. “The technology is scalable, with a connection capability of up to 100 machines per server. The data, which can be collected via a dedicated Collector PC software, can then be used to optimise production processes, maximise machine usage, or diagnose potential problems, all without having to visit the factory floor.